West System Fillers and Additives - CST The Composites Store, Inc.
See page 28 in the Users Manual for more details. 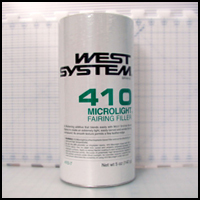 West System - 403 Microfibers, 6 oz. 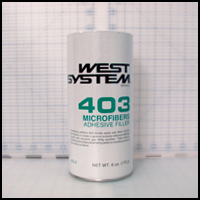 West System - 403 Microfibers, 20 oz. 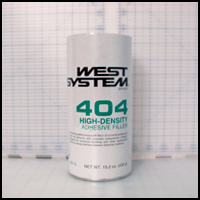 West System - 404 High-Density, 15.2 oz. West System - 404 High-Density, 43 oz. Epoxy filler for joints on naturally finished wood. 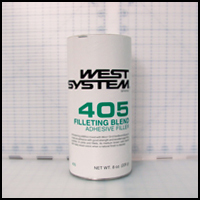 West System - 405 Filleting Blend, 8 oz. 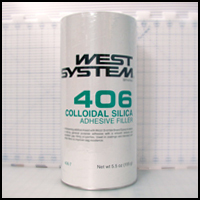 West System - 406 Colloidal Silica, 5.5 oz. West System - 406 Colloidal Silica, 10 lb. 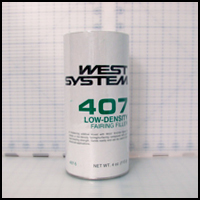 West System - 407 Low Density, 4 oz. West System - 410 Microlight, 2 oz. 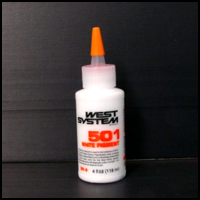 West System - 410 Microlight, 5 oz. West System - 410 Microlight, 4 lb. 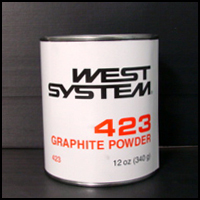 West System - 423 Graphite Powder, 12 oz. West System - 501 White Pigment, 4 oz. 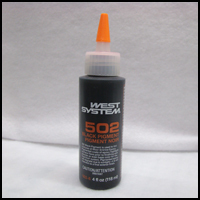 West System - 502 Black Pigment, 4 oz. 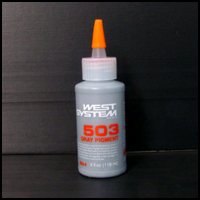 West System - 503 Gray Pigment, 4 oz.